This week Great War Photos will feature some Gallipoli related images as Wednesday will be ANZAC Day. At times someone with a casual interest in the Great War could be forgiven for thinking Gallipoli was an ‘Australian Battlefield’ but the reality is that the majority of troops who assaulted Turkey on 25th April 1915 were British. 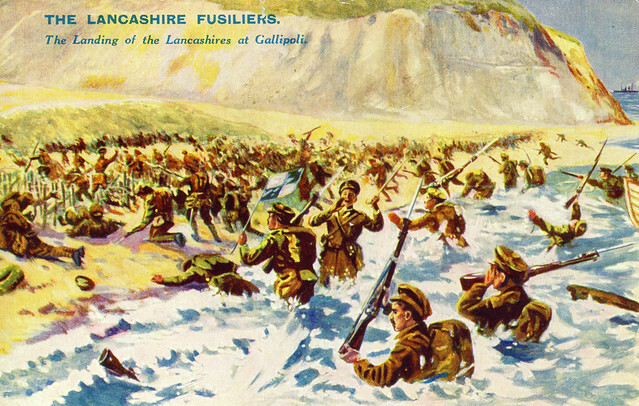 This image depicts the men of the 1st Battalion Lancashire Fusiliers landing at W Beach that day. Coming under fire from the bluffs above they took heavy losses and my own grandfather, a member of a Naval party from HMS Implacable, rowed them in and remembered the sea running red with their blood. The bravery of the men that day resulted in the award of sixVictoria Crosses leading to the legend of ‘six VCs before breakfast’. W Beach itself would be officially renamed ‘Lancashire Landing’ in honour of the action here on the first day of the landings. This entry was posted on 23/04/2012 by sommecourt. It was filed under ANZAC, British Army, Gallipoli, WW1 and was tagged with ANZAC, ANZAC Day, Gallipoli, Lancashire Fusiliers, Lancashire Landing, Victoria Cross. I’m after a hi res, large image of the Lancashire Landing to create a 3-D image for a memorial plaque. Can you help?